Instrument disinfectants can be based on different types of biocidal agents such as benzalkonium chloride, DDAC, glutaraldehyde, hydrogen peroxide, peracetic acid and sodium hypochlorite. A health benefit for patients can be expected for validated reprocessing of non-critical and semi-critical medical devices. A low adaptive response in combination with an inhibition of biofilm formation and removal of existing biofilm in the majority of species can be attributed to none of the biocidal agents. Overall, on surfaces of instruments where biofilm formation should be inhibited (e.g. flexible endoscopes), the use of peracetic acid seems to be the most appropriate option (low selection pressure, mainly inhibition of biofilm formation, mainly moderate removal of biofilm). Hydrogen peroxide and sodium hypochlorite have also a low selection pressure and can moderately remove biofilm, but they increased biofilm formation in more species. They seem to be appropriate on surfaces of instruments where enhancement of biofilm formation is of minor relevance. All three biocidal agents have so far not been associated with antibiotic cross-tolerance. 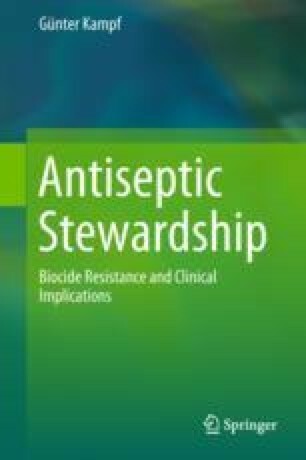 Benzalkonium chloride seems to be the least suitable biocidal agent taking into account the frequently observed strong and stable adaptive response, cross-tolerance to some other biological agents and selected antibiotics and the inconclusive effect on biofilm formation and removal.